Features: Works with all major receiver brands including Spektrum, Futaba, Hitec, JR, Tactic, and more. One-key setting mode with colored LED indicator light. 4 Pre-programmed flight Modes. 3 Wing Types: Normal Airplane, Flying-wing (Delta-wing) and V-tail. Supports 50Hz, 125Hz, and 250Hz Servo Frequencies Separate gain adjustment for each flight mode. Automatic gyro calibration (auto stick centering) at start-up. High Voltage (7.4v). Futaba S.Bus and S.Bus 2 compatible. Easy to use, extremely well-suited to beginners. Small, lightweight form-factor. Specifications: Input Voltage: DC 5V-7.4V, powered from the receiver directly Gyroscope: ±2000 dps, 1kHz Servo Frequency: 50Hz/125Hz/250Hz Servo Travel: 1520±500µs Limit 970-2070µs Gyr. For DJI Drone Flying Gloves Waterproof Touch Screen Multi-function Skiing Riding. Auto balance flight. 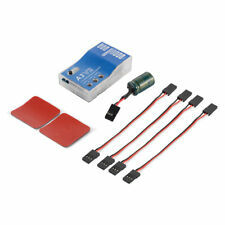 RC Car & Accessories. Redcon FT4RSB Receiver Ultra Light 2.4G 4CH FASST Mini Futaba Fasstsbus Receiver. 1PCS Small Size Fixed-wing Flight Gyro Balancer For NX3 Flight Stabilization. For Xiaomi Mi 4K Version RC Drone 4PCS CW/CCW Propellers Quick Release Paddle. AR6210 DSMX 6-Channel Receiver RX Support DSM2 for Spektrum Transmitter RC New. In addition to the advanced Auto-Recovery System, the A3 also includes an Auto-Hover mode which will put your 3D capable aircraft into a perfect vertical hover at the flip of a switch. All functions of the Eagle A3 are easy to setup via a simple on-board button and indicator LED. (flaperons) aircraft - Can also be used for 2 - axis on jets using 2 servos for ailerons and a servo on the. 2.4GHz Four-axis Aircraft WIFI image transmission 5G Quadcopter rRC Toy Drone. Elegant Waterproof Soft Silicone Protective Case with Lanyard For Insta360 One X. 2.4GHz Headless Mini UFO RC Quadcopter RTF Drone JRC H36 6-Axis Gyro 360° Flip. Extend Stick Rod Carbon Fiber With Screws For DJI Ronin-S Gimbal Stabilizer. Neck Shoulder Strap & Quick Release Buckle For DJI Ronin-S Gimbal Stabilizer 1Pc. 4 Flight Modes: Normal, Auto-balance, Auto-hover and Gyro Off modes. - The gyro can be attached flat or upright. - 3 Wing Types: Standard, Delta-wing (Flying-wing) and V-tail. - Automatic stick centering. Four flight modes: normal, auto-balance, auto-hover and gyro off modes. Three kinds of wing: standard, delta-wing (flying-wing) and V-tail. Auto hover can be realized by one key. Type: RC Model Vehicle Parts & Accs. 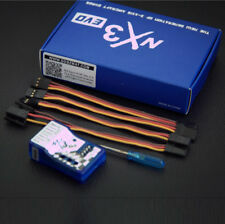 DC Motor Torque Waterproof Digital Servo Gear for RC Car 1/10 1/8 Truck Crawler. In addition to the advanced Auto-Recovery System, the A3 also includes an Auto-Hover mode which will put your 3D capable aircraft into a perfect vertical hover at the flip of a switch. Three wing types: S tandard, Delta wing (flight wing), V-tail. Four flight modes: Normal, A utomatic-balance, Auto-hover, T urn modes. Note: The real color of the item may be slightly different from the pictures shown on website caused by many factors such as brightness of your monitor and light brightness. The CC3D board is an all-in-one stabilization hardware which runs the OpenPilot firmware. An all-in-one stabilization hardware which runs the OpenPilot firmware. Tiny 36mmx36mm 4 layer PCB for superior electrical noise reduction and flight performance. HobbyEagle RC Airplane A3 V2 Gyro / Flight Stabilizer. User manual, videos, firmware ect can be found on the HOBBYEAGLE website below The auto-balance mode is designed especially for beginners or FPV applications. 1 x OrangeRX RX3S - 3 Axis V2 Flight Stabilizer. This compensates for unwanted changes in the airplane's attitude due to wind and other factors. In short, it makes your airplane much more stable in flight! Response Frequency: 100Hz. High Quality Air Float Inflatable Floating Airbag Buoyant Pad For GoPro Hero 7 6. 4 Pairs Propellers CW/CCW Prop Quick Release Blade For Parrot Anafi FPV Drone. Auto balance flight. Features: Works with all major receiver brands including Spektrum, Futaba, Hitec, JR, Tactic, and more. One-key setting mode with colored LED indicator light. 4 Pre-programmed flight Modes. 3 Wing Types: Normal Airplane, Flying-wing (Delta-wing) and V-tail. Supports 50Hz, 125Hz, and 250Hz Servo Frequencies Separate gain adjustment for each flight mode. Automatic gyro calibration (auto stick centering) at start-up. High Voltage (7.4v). Futaba S.Bus and S.Bus 2 compatible. Easy to use, extremely well-suited to beginners. Small, lightweight form-factor. 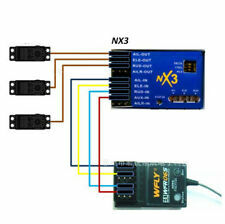 Specifications: Input Voltage: DC 5V-7.4V, powered from the receiver directly. 2, Gyro off mode. DC Motor Torque Waterproof Digital Servo Gear for RC Car 1/10 1/8 Truck Crawler. 1, Normal stability mode. 1/2/4Pcs MT2204 2300KV Brushless Motor for Mini Quadcopter QAV250 2X CW&2X CCW.